You’ve completed your primary and secondary medical school applications and are now being offered interviews at several of your top choice medical schools. What are the different types of medical school interviews? Before we get started, let’s review the different types of medical school interviews. An open ﬁle interview is the most common type. In an open ﬁle interview, the interviewer has access to all of your information, including all written documents, letters of reference and test scores. The interviewer may have no or limited access to your materials. These interviews therefore offer an opportunity to control the interview and dictate what is discussed. Typically, the panel comprises three interviewers and one interviewee. Their objective is to see how you manage pressure and how you respond to others. Students rotate through a variety of “stations,” remaining at each for eight to 10 minutes to address a particular question. In general, these mini interviews are designed to evaluate your professionalism, communication skills, ability to work with a team, compassion and ability to consider all aspects of a situation. What to watch out for in medical school interviews. But what pitfalls might not be so obvious? Anticipating these mistakes could keep you safe during medical school interview season. Related: Medical school applicants: Waitlisted? Want more interviews? Here’s what you can do. You studied for the MCAT. You composed multiple drafts of your personal statement. Why is it that you think walking in cold to your first medical school interview is acceptable? I find that many outstanding medical school applicants who have an impressive list of accomplishments are often not able to clearly articulate their motivations and paths to pursue a career in medicine. All great performances require practice, and speaking about yourself and essentially marketing your candidacy is not easy. Grab a friend, teacher, parent, relative, or consulting group who has more experience than you do in this arena. Practicing builds confidence which helps your performance. Related: So you want the the best medical school interview tips? 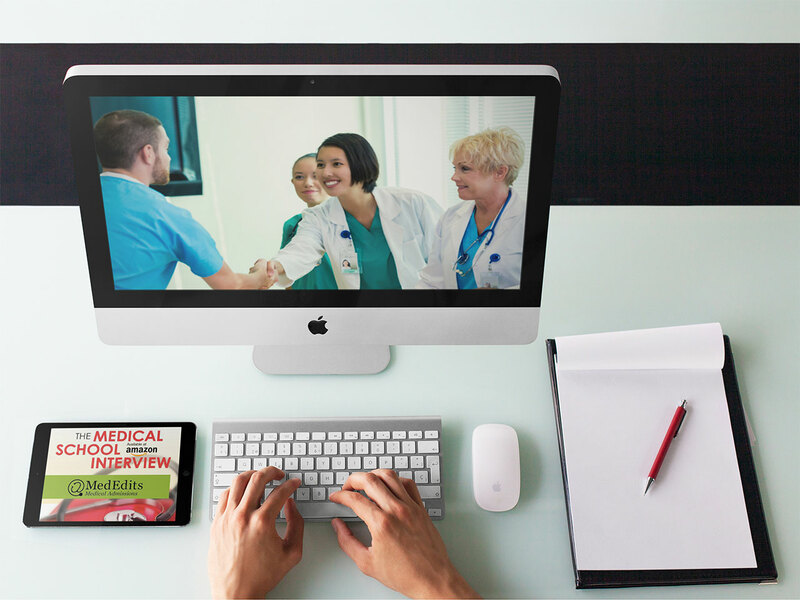 More than 140 Medical Schools with a list of their interview types, guidance, and much more. Related Video: What is a medical school letter of intent? On the opposite side of the coin, practicing too much can also hurt you. First of all, you don’t want your answers to sound rehearsed or canned. You want your medical school interview to be conversational so if you are fixated on what you have rehearsed, a conversation pattern for which you didn’t prepare can make you overly anxious. Over-rehearsed applicants often stumble when they receive a question they weren’t anticipating. This is also an issue for the applicant who has multiple interviewers. Try to keep your answers fresh, which can be challenging after being asked “Why do you want to be a doctor” for the 17th time. This can happen while you wait for your interview. Sometimes the interactions between candidates as they wait for their interviewer or a presentation about the school can be harmful. You don’t want to seem like a social outcast and sit alone in a corner of the conference room while the other applicants are chatting. You don’t want these casual conversations to cause you unnecessary anxiety before you enter your interviewer’s office. Try to stay away from, “So, where else have you interviewed/been accepted” type of topics. If such questions do arise, answer vaguely or change the topic without being rude. If you were invited for an interview, you are just as qualified as everyone else sitting in that room with you, and each interview is an opportunity for acceptance. Many myths are out there about what you “must do” or “not do” on interviews. Your interviewers are not robots; they are individuals. The vast majority of interviews are not scripted so the rhythm and flow of an interview will depend on many factors, including your interviewer’s style, level of experience and even his or her mood that day. It is important to enter each interview with an open mind as to how the interview might progress. Some less-experienced interviewers may feel uncomfortable having a fluid conversation whereas the more experienced medical educator might purposefully get off topic and start a conversation about something in your background that you didn’t expect. Research your school before your interview so you have a clear idea of its mission and values. You also want to try and tailor your answers so you fit these ideals as best you can. The applicant who says something that is not sincere or that is inconsistent with her background has fallen right into a major pitfall. The school that values community service is seeking students who have a demonstrated commitment in this area but also wants students who have other interests. When an applicant who has no background in community service says that she hopes to become involved in helping the underserved during medical school, her assertion seems patently false. Be true to yourself and make sure that everything you say is consistent with your background and experiences. Trying too hard to “stand out” or “be distinctive” during a medical school interview. Medical school applicants are always concerned about standing out from the crowd. You cannot change who you are on your medical school interview day. Most interviews are somewhat biographical so your experiences are what they are. I find that when applicants try too hard to be “different,” they often undermine their own success. Medical schools are not evaluating you on your distinctiveness, per se; they are trying to assess your motivation for a career in medicine, intelligence, communication skills and level of compassion, among other qualities. Candidates who have accomplished something truly unusual are evaluated differently, but these candidates are the exception. Applicants who exude confidence, enthusiasm and authenticity and who are “comfortable in their own skin” are often the individuals who stand out. A seasoned interviewer can sniff out insincerity. Trying to be someone or something that you are not will inevitably negatively impact your performance and your interviewer’s evaluation. Every interview dynamic is affected by the rapport between the interviewer and applicant, the interviewer’s approach and the applicant’s comfort level in speaking about himself, his motivations and his ideals. Be aware of the common pitfalls and be able to express who you are, why you want to pursue a career in medicine and how you got there. Still have questions? Contact me, my team, or consider a FREE 15 minute consultation. Next articleWhat is the Medical School Admissions BCPM GPA?